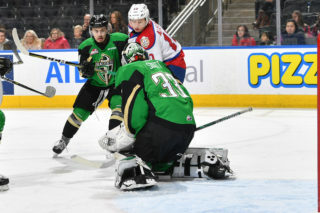 The undefeated start to the 2018-19 season continued for the Edmonton Oil Kings on Saturday night, and against a division rival, no less. 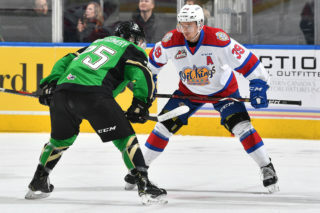 Carter Souch tallied a pair of goals and an assist and Dylan Myskiw made 41 saves as the Oil Kings (5-0-0-0) defeated the Calgary Hitmen (0-3-0-0), 6-3, in the Hitmen’s home opener in front of 7,520 fans at the Scotiabank Saddledome. 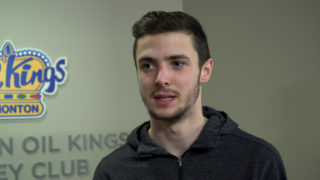 Quinn Benjafield also had a three-point night with a goal and two assists as the Oil Kings continue to explore unchartered territory, winning their first five games to start a season for the first time in modern franchise history. 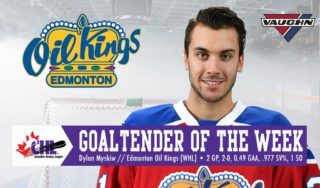 Myskiw’s record improved to an also flawless 3-0-0-0, as he stopped all 23 shots he faced in the opening 40 minutes before being bombarded with 21 shots in the third period alone. Matthew Armitage (0-1-0-0) suffered his first loss of the season for Calgary, surrendering five goals on 31 shots. Special teams was certainly a storyline in the game, as the Oil Kings scored twice on the power play, once shorthanded, and the Hitmen were unsuccessful in all six power play opportunities they were awarded. The game also marked the first meeting between the Oil Kings and their former head coach, Steve Hamilton, who now mans the Calgary bench. Benjafield’s first goal of the season doubled as Edmonton’s first shorthanded goal of the campaign, as the visitors took a 1-0 lead just 2:44 into the game, with the lone assist to Brett Kemp. Under four minutes later another first; this time the first career WHL goal by Jake Neighbours, putting the Oil Kings up 2-0 from Souch at 6:27. With the opening frame winding down Souch tallied his first goal of the season, making it a 3-0 game from Neighbours and Jacson Alexander on the power play at 18:26. The Oil Kings led the shot clock, 10-8, through the opening 20 minutes. The lone goal of the middle frame came on the stick of Alexander, the fourth Oil King to score his first of the season as Edmonton tallied their second power play goal of the game at 17:38, from Matthew Robertson and Benajfield, to give the Oil Kings a 4-0 lead heading into the second intermission. Shots were 18-15 Edmonton in the middle frame, and 28-23 through 40 minutes. The barn gates opened in the third period as both teams combined to score a barrage of goals, starting with the Hitmen’s Jake Kryski who notched his third of the season to spoil Myskiw’s shutout bid, unassisted, at 6:10 to make it 4-1. Calgary cut the Edmonton lead in half, 4-2, as Mark Kastelic notched his first goal of the season, from Luke Coleman and Vladislav Yeryomenko at 12:06. Souch collected his second goal and third point of the night to restore the Oil Kings three goal lead, 5-2, from Kemp and Benjafield at 15:48 before Kryski once again made things interesting, closing the gap to 5-3 from Riley Stotts and Josh Prokop with 18:15. Captain Trey Fix-Wolansky secured the Oil Kings win with his second goal of the season into an empty net, from Vince Loschiavo, with 26 seconds left to play. 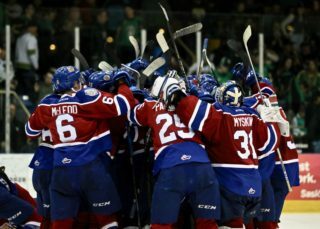 The third period was easily Calgary’s best of the game, as they dominated the shot clock 21-4 over the Oil Kings. They would outshot Edmonton 44-32 on the night. Calgary finished the night scoreless on the power play going 0-for-6, while Edmonton was 2-for-6 with a short-handed tally. Jake Kryski (CGY) (3), Dylan Myskiw (EDM) (2) and Carter Souch (EDM) (1) were selected as the Three Stars of the Game. 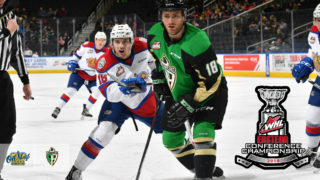 The Oil Kings are back in action Wednesday, October 3 when they host the Saskatoon Blades for a 7:00 PM (MT) start at Rogers Place.